Package Height: 2.1" Package Height: 1.4"
Package Length: 12.1" Package Length: 8"
Package Width: 11.6" Package Width: 3.7"
Package Weight: 1.2 lbs. Package Weight: 0.05 lbs. 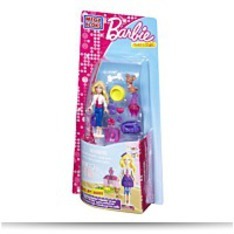 Compare results for Mega Bloks Inc Mega Bloks - Barbie - Build 'n Play Dolphin Adventure and Mega Bloks - Barbie - Puppy Pals Barbie. Which is best?